The Northeast blackout of 2003 which resulted in a $6 billion economic loss to the region could have been avoided by better communication across system operators. See my post Phase Synchronizer for a description of how this technology works. There have been five massive blackouts over the past 40 years, three of which have occurred in the past ten years. Many blackouts and brownouts occur due to the slow response times of mechanical switches, a lack of automated analytics, and poor visibility – a “lack of situational awareness” on the part of grid operators. Visibility is key to grid stability. Operators need to have actionable intelligence that shows them what is happening in real time so they can respond promptly and appropriately. The introduction of SCADA (supervisory control and data acquisition) systems gave a tremendous boost to visibility into grid operations. For the first time, data from multiple sources could be collected and analyzed. Many wind and solar photovoltaic generators do not have inherent inertial response because of the present controls associated with the power electronic interfaces to the grid. As a result, when these new technologies replace conventional generation, the frequency response and modal behavior of the power system will change.There will be a lack of inertia and governor response, different excitation, different locations of renewables which will all make integrated control of high speed system resources even more important. America is relying on a centrally planned and controlled infrastructure created largely more than fifty years ago before the age of microprocessors that limits our flexibility and puts us at risk on several critical fronts. Wide Area Situational Awareness (WASA) represents the monitoring of the power system across wide geographic areas. These broad area perspectives are necessary to maintain system knowledge and decisions that go beyond conventions of individual companies or even RTO boundaries. The requirements for WASA are architecturally significant from the standpoint of requiring uniformity across traditional systems operation boundaries. Enabling WASA based applications brings forward unique requirements and challenges for the Smart Grid infrastructure. AGC - Automatic Generation Control – Generators automatic respond in real time to control the power output of the electric generators in accordance with the set limits. - A computation based on measured frequency and computed economic dispatch. Generation equipment under AGC automatically responds to signals from an energy management system computer in real time to adjust power output in response to a change in system frequency, tile-line loading or to a prescribed relation between these quantities. A Generation output is adjusted so as to maintain a target system frequency (usually 60 Hz) AGC Regulates the moment by moment balancing of load and generation. Steady system frequency = good regulation. The AGC system adjusts the output of generators under its control, typically every 4-10 seconds in the western U.S. State of system is continuously assessed with input from SCADA algorithms that determine required control actions. Contingency – The unexpected failure or outage of a system component, such as a generator, transmission line, circuit breaker or other electric element. A contingency plan specifies actions to alleviate the impacts of a possible shortage or disruption of energy. The grid is operated using a conservative approach with margin for anticipated contingencies. This helps to maintain a reliable bulk electric system but also limits throughput capacity. Under selected operating scenarios, it may be advantageous to rely on real-time corrective controls following the contingencies instead of providing operating margins in anticipation of the contingencies. Contingency Analysis – (aka N-1 analysis) – Contingency analysis simulates the effects of removing equipment and calculates the results using a model of the power system. Makes sure the transmission system gives power users the ability to draw from a diverse set of power plants in different locations and with different operating characteristics. If the transmission system is robust, with a certain amount of redundancy built in, it can withstand the failure of it most critical lines or other components. EMS - Energy Management System – A computer control system used by electric utility dispatchers to monitor real-time performance of various elements of an electric system and to control generation and transmission facilities. Control Area Operator - An individual or organization responsible for controlling generation to maintain interchange schedule with other control areas and contributing to the frequency regulation of the interconnection. The control area is an electric system that is bounded by interconnection metering and telemetry. FERC - The Federal Energy Regulatory Commission - United States federal agency with jurisdiction over interstate electricity sales, wholesale electric rates, hydroelectric licensing, natural gas pricing, and oil pipeline rates. FERC is also responsible for ensuring the reliability of the nation’s high-voltage interstate transmission system. Not all transmission is subject to FERC jurisdiction. Public power entities such as the Los Angeles Department of Water and Power are not under FERC jurisdiction. Federal agencies also self-govern, so the Bonneville Power Administration, the Western Area Power Administration and the Tennessee Valley Authority all fall outside FERC’s authority. Finally, most of Texas and all of Hawaii and Alaska are outside FERC jurisdiction because they are not connected, or not tightly connected, to the interstate transmission grid. ISO - Independent System Operator - An independent entity that controls a power grid to coordinate the generation and transmission of electricity, provide open transmission access to all market participants on a nondiscriminatory basis, and ensure a reliable power supply. Each ISO coordinates controls and monitors the operations of the electrical power system. An ISO is usually not for profit and can advise utilities within its territory on transmission expansion and maintenance, but does not have the responsibility to carry out the functions/ There are currently eight ISOs including Alberta, California, Florida, New England, New York, Ontario, and Texas plus four RTO’s. NARUC - National Association of Regulatory Utility Commissioners - The trade association representing the state public utility commissioners who regulate electricity, natural gas, telecommunications, water and transportation throughout the US. These regulatory commissioners are charged with ensuring that the rates charged by regulated utilities are fair, just and reasonable. NARUC’s mission is to serve the public interest by improving the quality and effectiveness of public utility regulation. NASPInet– A distributed architecture linking the providers of synchrophasor data (publishers) with applications (subscribers) using a publish-and-subscribe middleware and data bus concept. NERC - North American Electric Reliability Council. PUC - Public Utility Commissions -State agency responsible for regulation of retail electricity to consumers and approve for electric generation transmission and distribution facilities. Reliability Coordinator – An organization responsible for the safe and reliable operation of the interconnected transmission system for their defined areas, in accordance with NERC reliability standards, regional criteria and sub-regional criteria and practices, This entity facilitates the sharing of data and information about the status of the control areas for which it is responsible, establishes a security policy for those control areas and their interconnections and coordinates emergency opting procedures that rely on common operating terminology, criteria and standards. Reliability Standards - Defined, written, measurable electric system practices and protocols created by NERC that have a material effect on reliability and enable operators to see when a standard is compromised. NERC has agreements with all electric utilities that call for them to comply with the standards, and sanctions exist for violations. For example, one reliability standard governs how facilities such as transmission lines are rated for power-carrying capability in order to avoid cascading outages and other problems. Another standard guides planners as to the types of system events to protect against. 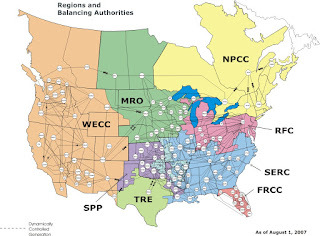 In July 2006, FERC designated NERC as the electric reliability organization under section 215 of the Federal Power Act, a new provision added by the Energy Policy Act of 2005 to establish a system of mandatory, enforceable reliability standards under FERC’s oversight. RTO – Regional Transmission Organization - Similar to an ISO though controls the operation of electric power transmission system over wider areas. An independent organization that coordinates, controls, and monitors the operation of the electrical power system and supply in a particular geographic area; similar to Independent System Operator. Where RTOs exist, the RTO and the transmission owners in the area decide which one (or both) prepares and submits transmission rates to FERC for approval. SA - Situational Awareness - The state of the power system components. Situation awareness, situational awareness, or SA, is the perception of environmental elements with respect to time and/or space, the comprehension of their meaning, and the projection of their status after some variable has changed, such as time. It is also a field of study concerned with perception of the environment critical to decision-makers in complex, dynamic areas from aviation, air traffic control, power plant operations, military command and control, and emergency services such as fire fighting and policing; to more ordinary but nevertheless complex tasks such as driving an automobile or bicycle. Situational Understanding – The capabilities and behavior of the power system components, how each relate to the entire power system state as a whole and how you manage each. Situational Prediction - How different situations and control commands affect the overall system. The optimal solutions to efficiently manage the system, correct system disturbances, or restore interrupted electrical services. Synchrophasors - Precise grid measurements taken by PMUs at high speed, typically 30 times per second, compared to one every 4 seconds using conventional technology. Each measurement is time-stamped according to a common time reference. Time-stamping allows synchrophasors from different utilities to be synchronized and combined, providing a precise and comprehensive view of a regional interconnection. Because these phasors are truly synchronized, synchronized comparison of two quantities is possible, in real time. These comparisons can be used to assess system conditions. Synchrophasor data enable the determination of grid stress and can be used to trigger corrective actions to maintain reliability. Visualization Technology. - Already used for real-time load monitoring and load-growth planning at the utility level, such tools generally lack the ability to integrate information from a variety of sources or display different views to different users. The result is limited situational awareness. This condition will grow even more acute as customer-focused efficiency and demand-response programs increase, requiring significantly more data as well as the ability to understand and act on that data. WASA – Wide Area Situational Awareness - Monitoring of the power system across wide geographic areas. Specifically according to FERC, the visual display of interconnection-wide system conditions in near real time at the reliability coordinator level and above. WECC - Western Electricity Coordinating Council - Regional forum for promoting regional electric service reliability in Western Canada and the Western United States. - WECC operates two reliability coordination offices that provide situational awareness and real-time supervision of the entire Western Interconnection. 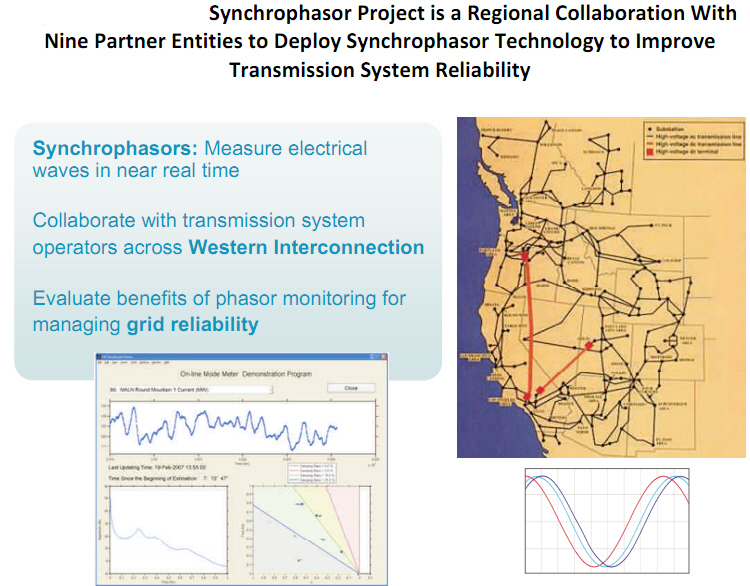 WISP - WECC’s Western Interconnection Synchrophasor Project - Will enable smart grid functionality such as improved integrated system operations, enhanced energy loss reduction, more efficient asset use, knowledge-based real-time advanced warning systems, improved market efficiency, and more. Here is an excellent example of the value of WASA. On January 26, 2008, transformation was lost at Bonneville Power Administration’s Big Eddy substation, near the northern terminus of the 3100 MW DC Intertie. Control center operators in the West observed oscillations and, after the power on the DC Intertie was reduced by 500 MW, it appeared that the oscillations had ceased. However, the oscillations had only been reduced by 50 percent, which is below the observable level, by dispatchers using their main tool — the Energy Management Systems in the control centers. However, in the California Independent System Operator’s control room, synchro-phasor data was available and presented to power system dispatchers. They were able to see the reduced, but still present, system oscillations. When the DC Intertie flow was reduced to zero MW, the oscillations stopped. Providing better situational awareness tools to operators of the system will enable them to see power system vulnerabilities much better and prevent such a vulnerability from ever becoming a disturbance or blackout. Wide Area Situational Awareness is one the four "Four Priority Functionalities" identified by FERC in their "Smart Grid Policy" adopted in July 2009. The plan provides guidance to inform the development of a smarter grid for the nation’s electric transmission system and prioritizes the development of key standards for interoperability of Smart Grid devices and systems. FERC will ensure that operators of the nation’s bulk power system have the equipment that gives them a complete view of their systems so they can monitor and operate their systems. Smart Grid technology will play a vital role in making this happen. Situational awareness of grid behavior is being transformed by wide-area-measurement networks. Only recently have time-synchronized, high quality measurements (from phasor measurement units – PMUs) worked their way into operating rooms of reliability coordinators and balancing authorities. 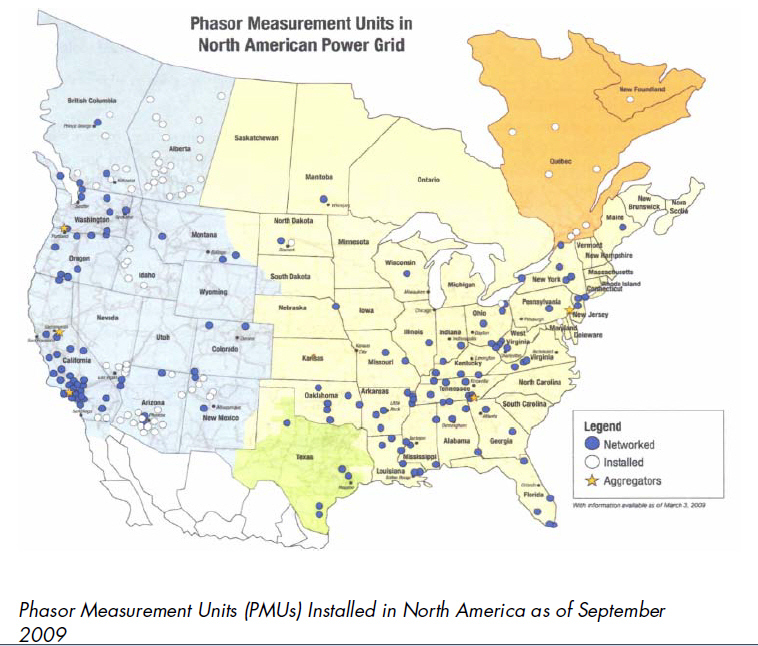 The North American Synchro-Phasor Initiative (NASPI), led by NERC and supported by DOE, is advancing the coordination of the deployment of PMUs and the networking of their measurements for wide-area situation awareness and other applications. The Energy Independence and Security Act of 2007 (EISA) requires FERC, once sufficient consensus has been achieved through a process coordinated by the NIST, to adopt standards and protocols necessary to ensure smart-grid functionality and interoperability in the interstate transmission of electric power and in regional and wholesale markets. NIST has engaged utilities, equipment suppliers, consumers, standards developers and other stakeholders in a participatory public process to identify applicable interoperability standards, gaps in currently available standards and priorities for new standardization activities in Wide Area Situational Awareness. It developed use cases are a method through which to describe applications and the requirements needed to support them. CA - Contingency Analysis - An Energy Management System (EMS) application that analyzes the security of a power system. It calculates, identifies, and prioritizes: current and power flow overloads in equipment, voltage violations at buses, and system stability problems that would occur if contingency events happen in the future. Wide Area Control System for Self Healing Grid Application - The Wide area control system functions comprise a set of computing applications for information gathering, modeling, decision-making, and controlling actions. Voltage Security - The Voltage Security function is designed to detect severe low voltage conditions based on phasor measurements of Power and Voltage and upon detection, initiate corrective action such as load shed. Monitoring Distribution Operations as a Part of WASA - The results of the analysis are aggregated at the demarcation lines between distribution and transmission. Voltage, Var, and Watt Control (VVWC) - The application calculates the optimal settings of voltage controller of LTCs, voltage regulators, Distributed Energy Resources, power electronic devices, capacitor statuses, and may enable demand response means for optimizing the operations following current objectives. Mitigate, or even prevent, blackouts - According to the DOE Final Report on the August 14, 2003 Blackout in the United States and Canada, use of data from wide-area measurement systems (WAMS), including synchro-phasor measurements, could have mitigated or even avoided the estimated $4.5 billion in losses suffered by over 50 million people in the 2003 blackout of the northeastern U.S. and Canada. Accommodate fast recovery from emergency state to normal state. Situational awareness needs to include information from the distribution and customer systems. These systems are becoming more interconnected with two way power flows becoming more common. Utilities have generally deployed silo systems Smart Grid is about an enterprise platform. All departments sharing data and analytics. Actionable intelligence needs to be integrated between IT systems and within the business processes. WASA creates very large volumes of data which will present challenges in information processing and management. Advanced software and systems will be needed to manage, process, and render this data into a form suitable for human operators and automated control systems. The Institute’s process should strive to identify the core requirements for such software and systems that would be most useful to system operators in addressing transmission congestion and reliability. The DOE is providing grants to install more than 850 PMUs. Per the DOE, these PMUs “will cover 100% of the U.S. electric grid and make it possible for grid operators to better monitor grid conditions and prevent minor disturbances in the electrical system from cascading into local or regional power outages or blackouts. In October 2009, the Western Electricity Coordinating Council (WECC) was awarded $54 million of Smart Grid Stimulus funds (See my blog Smart Grid Stimulus) to install over 250 phasor measurement units across Western Interconnection and create a communications system to collect data for real-time situational awareness. (Project Scope White Paper PDF) The Smart Grid stimulus is a matching grant program so total project value will be $108 million. The project will improve integrated systems operation across 11 organizations and in all or part of 14 western states, enhancing reliability and reducing energy loss. In the same grant, the New York Independent System Operator was awarded $37 million to deploy a range of smart grid technologies, including 35 new phasor measurement units and 19 phasor data concentrators, across NY to allow area-wide control, and an open, flexible, interoperable, secure, and expandable communciations system that will work in concert with the existing control and monitoring systems. The Midwest Independent Transmission System Operator was awarded $17 million to install, test, integrate and monitor 150 phasor measurement units in strategic locations across the Midwest on independent transmissions system operators, which will improve the energy dispatching, system reliability and planning capabilities. PJM Interconnection was awarded $14 million to deploy over 90 phasor measurement units and other digital monitoring and analysis technologies across 10 states that will provide real-time data on the operating conditions of the transmission system, improving reliability and reducing congestion. American Transmission Company was awarded $11 million to build a fiber optics communications network for high-speed communications to maximize the full capability of phasor measurement networks across ATC's transmission system. Reliability Coordinator saturation Demo – Projects to establish an extensive measurement hardware, communications, processing and applications deployment within one of the Reliability Coordinator regions . This could include a new, dedicated fiber network for all bulk power transmission system communications linking the synchrophasor measurement devices with the control center(s) and linking to generation and transmission assets that facilitate phasor and other phasor-related applications. Reliability Coordinator Synchrophasor Backbone Demo – Projects to establish a communications network to link standard configuration measurement and data collection hardware to deliver fast data traffic between Reliability Coordinators and major Balancing Authorities within an area. This should serve as the foundation for supporting multiple synchrophasor applications. Phasors for Renewable Generator Interconnection –Projects to install a networked phasor measurement unit at every large renewable generator and key substation within a specific area, e.g., within a single Reliability Coordinator’s region. Design and initiate a research project for data analysis to identify impacts of intermittent generation over various time spans. Link to intermittent generator analysts and share data patterns with adjacent Reliability Coordinators to design methods to feed patterns into intermittent generation forecasting and grid analysis. 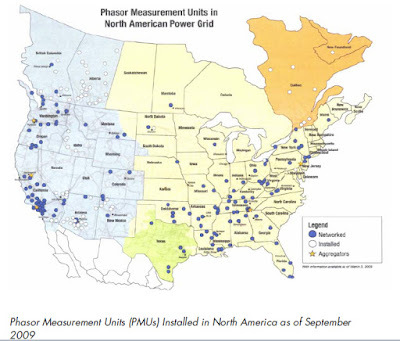 Integrate phasor data into real-time grid monitoring and operations. Look for ways to use the phasor data to feed into new renewable integration opportunities, including ancillary services provided by demand-side resources. NASPInet Demo –Following the release of the draft NASPInet specification, expected in mid-2009, there will be pilot demonstration projects to further refine and modify this specification based on lessons learned from interconnecting multiple vendors and a spectrum of applications in a common architectural framework. In FERC’s plan, the wide-area situational awareness efforts, with appropriate cyber-security protections, can rely on the NASPInet work undertaken by the North American SynchroPhasor Initiative (NASPI) and will require substantial communications and coordination across the RTO and utility interfaces. FERC encourages the RTOs to take a leadership role in coordinating the NASPI work with the member transmission operators. National Grid UK - A leading example of higher economic efficiency through better monitoring and more optimal control of the transmissionsystem is at National Grid in the UK. To prevent grid instabilities, transmission grid operators have historically had to constrain output. This leads to lost revenues and underutilized systems. 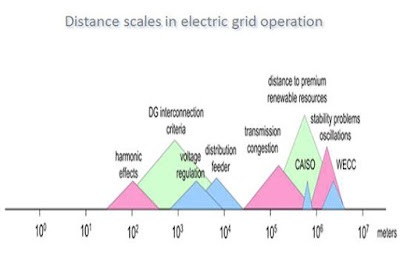 National Grid is deploying security-constrained scheduling to maximize transmission efficiency by utilizing a networkmodel that enforces thermal security criteria using both pre-contingency and post-contingency controls.12 The use of both types of controls—as opposed to all conventional security constrained scheduling solutions, which only use pre-contingency actions—enables more efficient use of the transmission grid and higher economic efficiencies. This solution will be in operation by the end of 2016, and National Grid expects to save millions of pounds annually in their balancing energy costs as a result. Patel M, S Aivaliotis, E Ellen, et al. October 2010. NERC Real-Time Application of Synchrophasors for Improving Reliability. Novosel D, V Madani, B Bhargavam, V Khoi, and J Cole. January-February 2008. "Dawn of the Grid Synchronization." Power and Energy Magazine, IEEE, vol.6, no.1, pp.49-60.